Hills Shire Mayor, Councillor Yvonne Keane, has written to the Minister for Local Government, Paul Toole MP, requesting that statistics on dog attacks in The Hills be considered as a basis for a review of the Companion Animals legislation across all Local Government areas. She asked that consideration be given to those dog breeds or cross breeds responsible for a disproportionate number of attacks when reviewing the legislation. “We’ve had 77 incidents of dog attacks within The Hills Shire between the period of 1 July 2015 to 13 September 2016,” Mayor Keane said. “From our reports, we know that at least 14 per cent of all attacks were made by the American Staffordshire Terrier breed followed closely by the Staffordshire Bull Terrier and the German Shepherd. Hills Shire Councillor Alan Haselden said he supported Mayor Keane’s recommendations to Minister Toole. “The issue of dangerous dogs has been highlighted by the recent incident in Kenthurst, where three American Staffordshire Terriers attacked a tradesman who was invited onto the property,” Clr Haselden said. “Statistics for the State show that American Staffordshire Terrier and Staffordshire Bull Terrier consistently account for around one-third of all attacks and this is why I am advocating for these breeds to be added to a nationwide list of restricted breeds. “One of the primary responsibilities for elected officials is to ensure the safety and wellbeing of people in our community. If these closely related breeds were added to the restricted list their numbers would significantly reduce over time and owners would confront the reality of the propensity of the breeds to attack people. “Restrictions are most effective if they are nation-wide and I would ideally like to see Council make representations to the Federal Government. “Literally hundreds of breeds exist for people who wish to own a companion animal, without running the risk of an attack on community members,” Councillor Alan Haselden added. 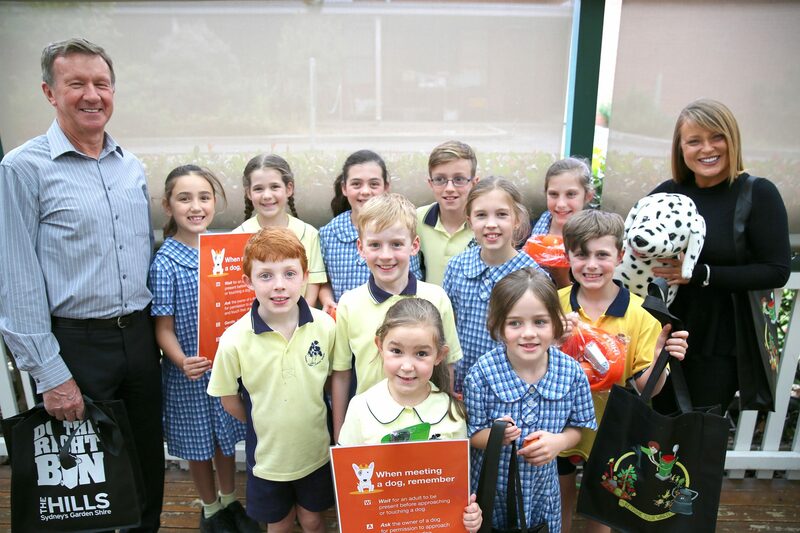 Recently, Mayor Keane and Councillor Haselden joined school-aged children at Samuel Gilbert Public School Out of School Hours Child Care Centre to experience first-hand the interactive dog safety classes delivered by The Hills Shire Council. Harry, the program mascot and Council officers were also on hand, bringing the program’s important safety messages to life through role play and active workshops. “The Dog Safety Program is a free service to all schools, community groups or any other organisation operating within The Hills LGA and I encourage people to take advantage of this wonderful resource,” Mayor Keane added. For more information visit www.thehills.nsw.gov.au and search for Dog Safety Program.